It should by rights be raining in Methoni. Certainly the local olive growers are worried about the impact of the dry weather continuing well into October. The olive harvest will start at the end of the month and without rain, yields will be lower and the olives more acid - or so we've been told. But for us feckless travellers, yet more beautiful sunny Greek days are just a bonus. 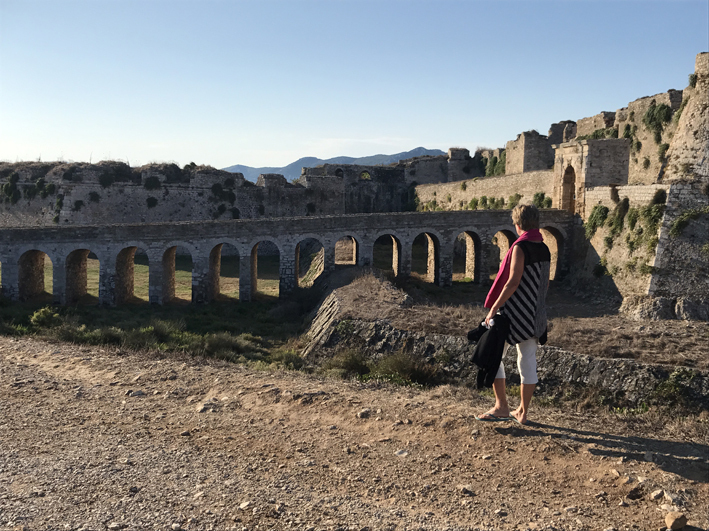 We hope to be based in Methoni (on the bottom left hand corner of the western-most Peloponnese finger - see map at the very bottom of this blog) until early November, because some lovely friends of my father have lent us their holiday house. And the town is looking wonderful. 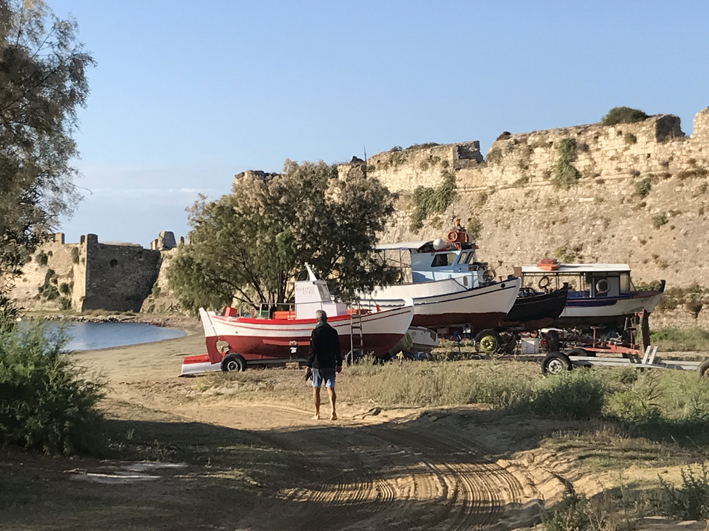 Tourist numbers are right down, so its attractions - a dramatic waterfront castle, a sandy beach, a harbour full of picturesque little fishing boats, and some nice tavernas - are mostly just for us. In the sunshine. The weather means we've been able to continue with our pre-breakfast swims - just a wonderful way to start the day. In Methoni we tend not to swim from the beach, but from the rocks under the castle walls - it's such a spectacular spot. I took some photos this morning of our route from home to our swimming place - along the top of town, past the castle moat and the fishing boats and down to "our" harbour. 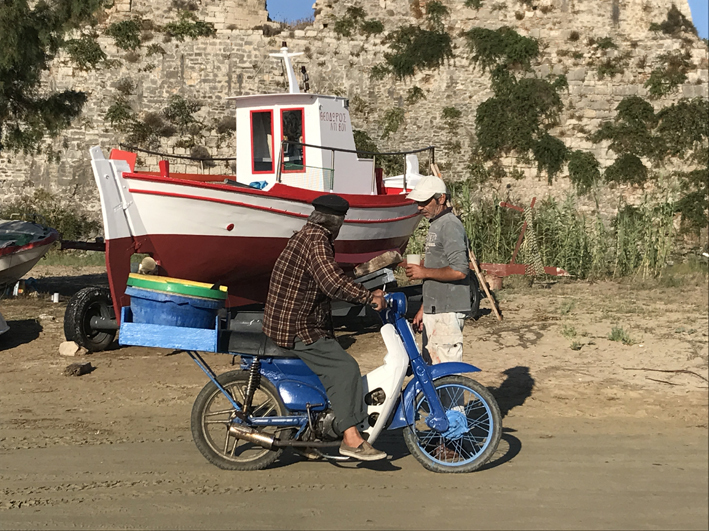 Gnarled Greek men were tending to their boats, or bringing fish back in open crates on the back of their mopeds, and the castle (and Geoff) were looking very fine in the morning light. Walking down towards what used to be the moat. Walking towards the swimming spot below the castle. Note the fisherman on the scooter. He'll have been out in his little boat this morning and is bringing the catch home on the back of the bike. Perfect timing. He stopped to have a chat to his mate painting his boat, just as I had my camera out. You can see the colourful plastic bowls on the back of the scooter. That's for the fish.